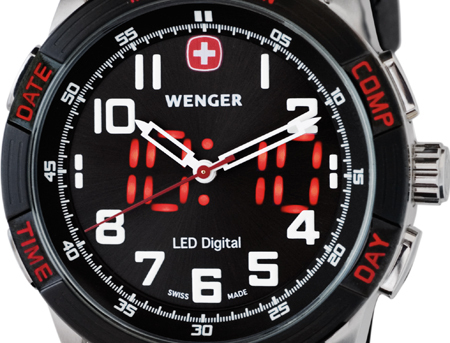 You’ll be the best-looking navigator in the city — or on the trail — with Wenger’s high-end Nomad Compass watch. The multifunction watch has a stylish look but is designed with adventurers in mind. For $375 you get a digital compass, date, day and time that displays via a red LED. Plus, you get the traditional numerals along the outer edge of the face with hour, minute and second hands. 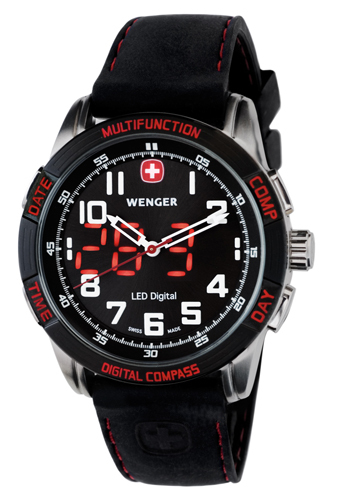 The watch’s brushed stainless steel case, black face, and black silicone band are accented with red to give it a classic Wenger Swiss Army look. On the performance side, it’s water resistant to 100 meters. For nighttime viewing, the numbers glow in the dark — but not the hands. Wenger says the non-glowing hands allow for easier viewing of the LED in dark conditions. To operate the compass, point the Wenger cross in the direction you want to go and then press the compass button — one of four function buttons. The compass bearing will display in the LED screen in degrees (e.g., 90 degrees denotes east; 180 degrees denotes south, etc. ).